Last week I discussed small, inexpensive point-and-shoot cameras to carry with you on the John Muir Trail. This week, we’re going to step up our game a bit. The first question you might ask is: why go bigger in the first place? After all, a larger camera is a heavier camera. Great question! There are actually two reasons. First, a larger camera means a larger image sensor. In this age of digital photography we have lost sight of this critical element. Back in the good old days, it was pretty easy to see the size of the “image sensor”; it was known as film. The smallish 110* format had an “image sensor” of about 221 square millimeters and produced photos of unexceptional technical quality. The format most enthusiast or professional photographers used was 126* (also known as 35mm) which had an “image sensor” of about 702 square millimeters and was technically quite sufficient. Beyond that there were medium format cameras (like the pricey Hasselblad) and view cameras (like what Ansel Adams used). Nowadays, few people use film and, therefore, few people see the image sensor. It’s buried within the camera body. A young photographer, who has never used film, might be forgiven for wondering why anyone would want to buy a Nikon D800, for example, which weighs two-and-a-quarter pounds (before you attach a lens) when their iPhone can take a perfectly good photo. 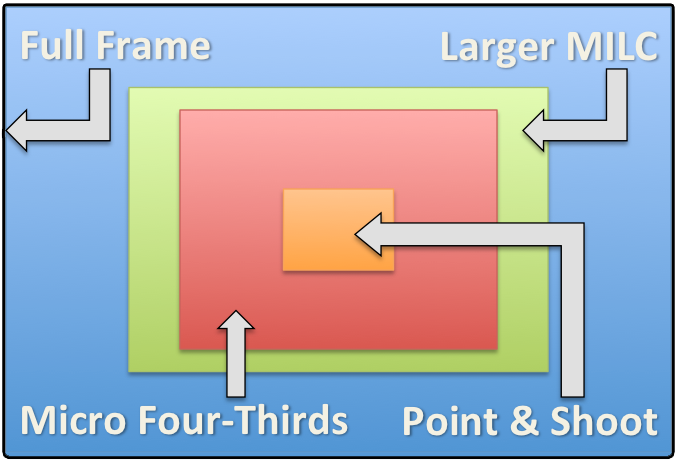 What does a larger image sensor do for you? A larger sensor will also enable you to capture more dynamic range (the ratio between the darkest and brightest part of the image that still has detail in it). If you photograph a scene with your point-and-shoot camera that has a large dynamic range (bright daylight combined with deep shadows, for example), some of the photo may be pure black or pure white. That is generally less of a problem with larger sensors. The second advantage of a larger image sensor is that they come on cameras that have better lenses. Camera bodies get all the hype. Their bells and whistles are prominently displayed in the photography magazines and advertisements. What professional photographers know (which new photographers may not) is that image quality is driven far more by the quality of the lens than by the doodads and adornments on the camera body. If you would like to carry a camera with a significantly larger image sensor, and a better lens than your typical point-and-shoot, you couldn’t have picked a better time to do so. Mirrorless-interchangeable-lens-cameras (MILCs). These cameras are a relatively new development. They incorporate larger image sensors (some as large as a good DSLR) but manage to keep the size and weight of the camera down by eliminating the mirror and optical viewfinder (which, on a DSLR, allows you to compose the shot by looking in the viewfinder and seeing through the lens). Instead, you use the LCD screen to compose the shot. The Fujifilm X, Samsung NX and Sony NEX cameras are examples of cameras that use even larger sensors than the micro-four-thirds format. You’ll find they weigh a little more, and perform a little better when it comes to dynamic range and low-light performance. All the new models record HD video, as well. If you are interested in stepping up from a standard point-and-shoot, but you are scared off by the weight and expense of a top-of-the-line DSLR, MILCs are a great way to go. The micro-four-thirds format has its own website. If you want a larger image sensor, check out the second list on this website. One drawback to these cameras: you must use the LCD screen to compose the shot. That means more battery use, which means you’ll be carrying more spare batteries. If you have higher ambitions for your photographs and video, it will be well worth the extra weight. *Why is 110 film called “110”? Who came up with “126”? Almost all film number designations come from the same place, a little company you probably once heard a lot about, but not much any more: Kodak. Another great article – hit the nail on the head. I switched from a Canon 5d to a Fujifilm x100: 4 pounds vs. 1 pound. The x100 is a superb landscape camera, with a fixed, moderate wide angle lens optimized for the camera and sensor. I’ve found the colors and dynamic range to to outstanding, and the fixed lens lets me concentrate on the image rather than fiddling with the camera. Not everyone’s cup of tea, but for someone who wants to do some serious photography on a long trail, the x100 should be on the short list. Happy trails! That X100 is a pretty sweet machine, no doubt. And I am naturally attracted to the idea of carrying a fixed focal length lens (as I will discuss in the final installment). There is no doubt that the X100, in the right hands, is capable of shots that equal what you can get with a DSLR. It’s a good looking camera, too!